Considered a sacred tree, the Shea-Karite tree grows naturally in the wild of the dry Savannah belt of West Africa and this trees can live up to 300 years. The shea butter comes from the nuts found on the tree by removing the outer shell. The nuts are crushed by hand so they can be slowly roasted into shea butter. Once this has been done, the butter is kneaded by hand in a large basin of water to separate the oils also known as the fatty acids. These fatty acids are what provides the restorative properties making it one of the best options for skin care and more. To get the final product, the shea butter is removed off the top and cooled until it hardens. 25 years ago The Body Shop started to work with the Tungteiya Women's Association in Ghana and the shea butter was their first Community Trade ingredient. The Body Shop choose to do amazing things like always and support female entrepreneurs through this Community Trade partnership and together we can empower these amazing women from Ghana that produce the shea butter and helps us #CareWithShea to be able to support their children's education. Don't you love when shea butter does more than just giving you very soft skin? The Body Shop shea butter is 100% natural and vegan and this moisturizing multi-purpose butter can be used on the body, hair, face and lips. It has an amazing creamy and melting texture and if you wander how many nuts do you need to make 150 ml of shea butter the answer is 192 shea nuts. Shea butter makes skin restored with moisture. Instantly relieves and soothes the feeling of dryness, itchiness and tightness of sensitive and very dry skin. Heals burns and rashes, amazing cuticle softener, perfect to use as a lip balm, highly moisturizing, anti-inflammatory- protects skin from free radical. Very calming and deeply nourishing for skin troubled by eczema and psoriasis. Prevents irritations after shaving and it can be used as a natural hair conditioning. 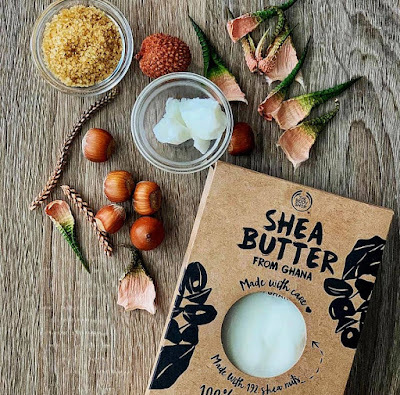 The Body Shop raw shea butter is the perfect natural product that will cocoon you from head to toe with rich moisture an you can use it to DIY home made skin care products like a lip tint, a lip balm, a lip scrub or a body scrub and even a hair mask. I never ever bought a lip scrub because it's so easy and fun to make your own, just take a bit of shea butter and mix it with sugar and add a bit of honey too. Mix all together and use it to scrub those lips and make them super soft and kissable. 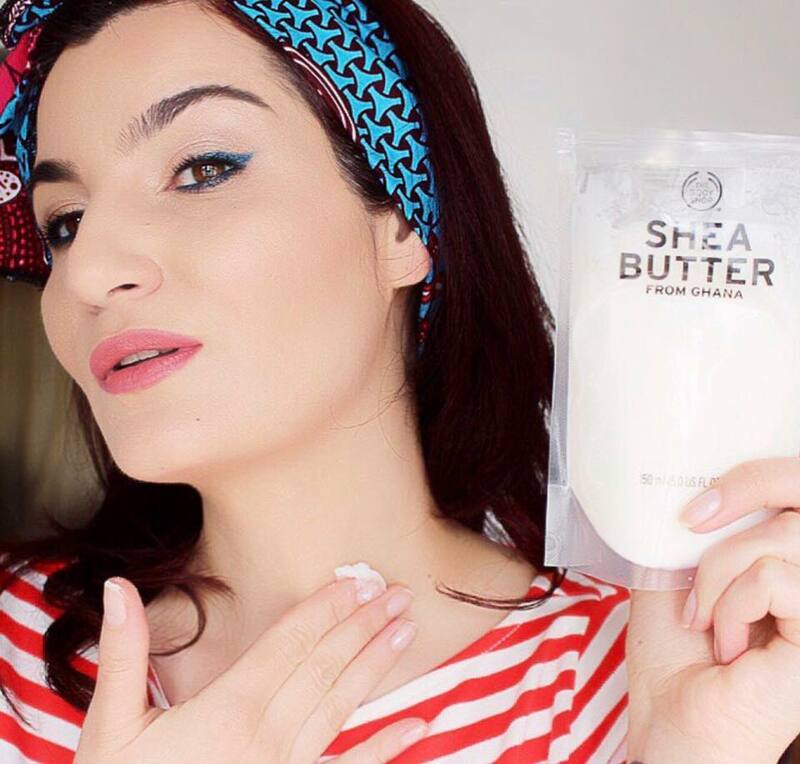 Are you already using shea butter ? ********This product was gifted to me by The Body Shop NL. Happy to hear,I think its nice to know a bit about the products we use. Thanks for sharing a great info about the shea butter. I love using skin care products. Shea butter sounds a great brand I'll try to find this! I really love using products with shea butter, it's make my skin so soft. This product is really a must try. Me too, shea butter products are so good for my skin! You should definitely try it . I use shea butter body lotion and yeah...it makes the skin silky soft. I love it! I am so happy to hear you also like products with shea butter. Sounds like a great product, many of my favourte skincare products have shea butter in it. What a lovely looking product. I like shea butter products a lot. They always work for my skin and hair. This looks great! I'm always looking for good solutions to dry skin! Thank you for sharing the knowledge about shea butter. I learned something new today. I never heard about this before. It sounds really cool and I would like to use it . I have never really known what shea butter is for, so this was an incredibly useful post. This brand also looks really great.